If your rooms have not been designed with tidy in mind, then it’s hard to keep them that way. There are bound to be things left lying around if there’s no convenient place to keep them. We would like to fix that. If you are a hoarder then it’s even more important to make sure your home has adequate storage provision for all that stuff. When it comes to your clothes and shoes, walk-in wardrobes are a fabulous feature if you have the space and sliding door wardrobes are a great way on increasing your storage capacity if your bedroom is small. Fully adjustable interiors achieve the maximum storage from your wardrobe space with strategically-placed shelves, interior drawers, single and double hanging lengths, shoe racks or tie rails offering any combination of versatile solutions. Most homes have many corners, cubby holes, under-stairs and space in the eaves which can easily turn into glory holes where it’s impossible to find anything, and admit it, you end up throwing things in and slamming the door on the spiders. With a little help from us you can turn that space into attractive, practical and fitted storage that’s purpose built to store your own particular form of clutter. So from golf clubs to saddles, fabric rolls to footballs you can keep it neat and accessible. We would like to thank you for another excellent job from concept to final fitting, on time, yesterday. Special thanks to Neil and Aaron for their expertise on our project and also to the rest of the team. 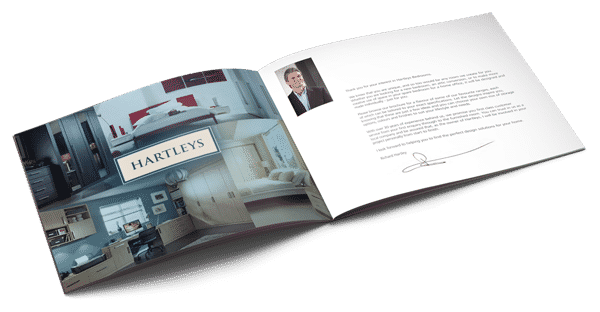 We would have no hesitation in recommending Hartleys to anyone considering using your company. Kindest regards. A good choice of exterior and interior configurations, and high quality finishes. The design advice was helpful and constructive, not imposing or 'pushy'. Very happy with the service and product. Delighted with the quality of the units and in particular the expertise of your fitter, Aaron. We would love to let you see the room when it's totally finished, so please get in touch after Easter. We are thrilled with our new bedroom furniture! Excellent service; love the bedroom! Excellent service from everyone concerned. The quality of the furniture meets our expectations in all aspects. Thank you very much.